Is it sad that I just had to double check with Thomas who is playing in the Super Bowl?! That is actually quite sad being that I won 2nd in my fantasy league this year...lol. It probably eats everyone alive in my league that some how I won the whole thing last year and 2nd this year and I have no clue how. I must just be a drafting wizard ;) Cheers to working smarter not harder! In other sporting news, did you know the Handball World Championship was this past weekend?! I always thought handball was just the game we played in elementary school! Who knew it is actually a huge sport, and Norway just won their first medal ever! Anywho, regardless of who's playing, Super Bowl Sunday is always a winner in my books. Who doesn't like a great sporting event with even greater company, gorging on burgers, and other cute hand-held things, and geeking out on all the amazing commercials? I'M IN. I wish I could say I'm a big fan for a team this year who has proudly worn their jersey every Sunday since the season started. But since I'm not, you can find me with my bandwagon jersey on hanging by the bar where all the snackies are. Since there's so many yummy things to munch on at a SB party, you probably don't want to eat a whole burger, That's why little mini burgers are so perfect! -and last but not least, the MVP, throwing the Hail Mary of all Hail Mary's, "THE CLASSIC" with candied bacon. -Preheat the oven to 350 degrees. Slice the jalapeños and place in an even layer on a baking sheet. Drizzle with olive oil and honey. Stir to coat. Place in the preheated oven and roast until soft and golden brown, stirring occasionally. -While the jalapeños roast, for the chipotle cream, mix the finely chopped chipotle peppers, adobo sauce, minced garlic, sour cream, and mayonnaise all together. Add more peppers if you want it spicier and add salt & pepper to taste. -For the guac, mix the smashed avocado together with juice of 1/2 a lime, handful of chopped cilantro, 1 minced garlic clove, and salt & pepper to taste. -For the burgers, mix the beef with the chipotle pepper, adobo sauce, spices, and salt pepper and form into 2 inch patties of equal size and thickness. -If you have a grill, GREAT! But if not, heat a large oven proof skillet over medium heat until hot. With a little olive oil in the pan, place the patties down and sear until brown on each side. Place in the oven at 350 degrees to finish cooking through to your liking, about 10 more minutes. -When you think the burgers are about done, take them out and place small slices of pepper jack over each patty. Turn the oven to broil and melt the cheese until bubbly. -With the oven still on broil, place buns brushed with olive oil on a baking sheet and broil until buns are toasty and golden. -To assemble: Place a layer of guac on the bottom bun. Top with burger, sliced red onion and roasted jalapeños. On the top bun, smear a layer of chipotle cream. Voila! 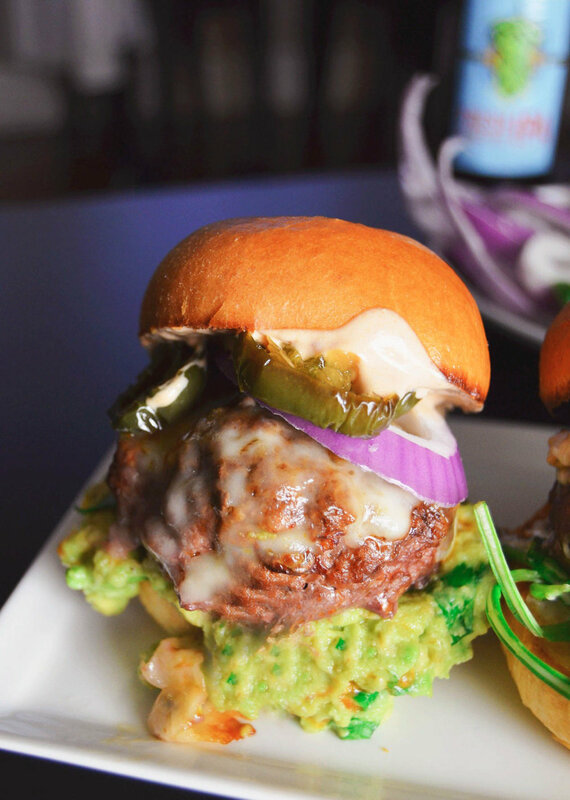 Guac-y slider magic. -Mix all the ingredients for your aioli. Add more salt or lemon juice to your liking. -For the burgers, season meat with salt and pepper and form into 2 inch patties of equal size and thickness. -When you think the burgers are about done, take them out and place the crumbled blue cheese over each patty. Turn the oven to broil and melt the cheese until bubbly. -To assemble: Smear the aioli on the bottom bun. Then place a small bunch of arugula and place the patty on top. Place thin slices of pear over the burger and then the top bun. -to candy the bacon, toss bacon with 1/3 cup of brown sugar in the large bowl. On a foil lined baking sheet, place bacon in an even layer and season with pepper. Bake at 350 until crispy, turning halfway though. Total baking time should be around 25 minutes! If it needs longer, just watch it carefully so it doesn't burn. -When you think the burgers are about done, take them out and place slices of cheddar over each patty. Turn the oven to broil and melt the cheese until bubbly. -To assemble: Smear the aioli on the bottom bun. Then place the candied bacon and patty on top of the bacon. Top with tomato and onion.